This layered bob is blow-dried to smooth down the top while turning the ends slightly out for a pokey finish. The grown out bangs are worn draped across the forehead and complete the overall look brilliantly. Regular trims are needed to maintain this hairstyle. 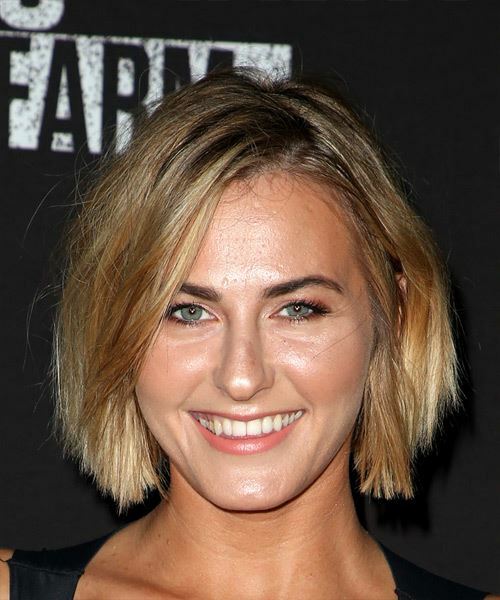 Scout Taylor Compton looks beautiful here in a chic bob that falls just past the chin. This cut is ideal for showing off her strong facial features, especially her eyes and smile. The grown out bangs provide her face with a nice frame while the rest of her hair maintains an edgy windblown shape that falls just past her jaw line. The layered ends give her locks a healthy appearance and gives her fine hair the illusion of being thicker. This â€˜do has lots of movement to it and works with both casual and formal attire. Backcombing at the roots and throughout the lengths and ends gives her locks added volume and style. Scout looks fabulous here in golden blonde locks that flatter her skin tone and eye color nicely. Having light blue eyes and a warm skin tone, she looks best in yellow and golden blonde shades, as well as her natural dark blonde color. This particular color has a hint of wheat blonde to it at the tips that highlights her warm complexion and makes her eyes pop. The roots have been left a bit darker for a more natural look, and to match her dark eyebrows. Use a paddlebrush to get this pokey straight blow dry.